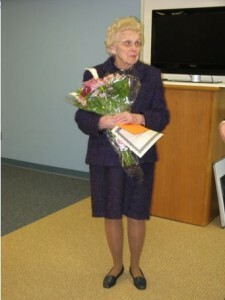 OLD SAYBROOK – The Acton Public Library will be displaying Jane P.R. Nettleton’s original quilting designs in their atrium display case for the months of January and February. The Acton Public Library is open Monday through Thursday from 10 a.m. until 8:30 p.m., and Friday and Saturday from 8:30 a.m. until 5 p.m. The library is open on Sundays from 1 to 5 p.m.
AREAWIDE – During February the Marshview Gallery at the Estuary Council of Seniors in Old Saybrook features the art of Carlos Rios. Born in Colombia, Rios began his training at the Academia Superior de Arte and Bellas Artes in Colombia. He moved to the U.S. in 1965 to further his education at the Paier College of Art in Connecticut. He has lived with his wife in Milford for over 30 years. Rios works in oils, acrylics, pastels and watercolors. His style and taste is eclectic, ranging from impressionistic to contemporary. He is constantly experimenting and creating new works, as well as researching and developing new materials, media and ideas to use in the creation of new pieces. His work is internationally known, and his original paintings and prints are in collections and exhibits throughout the world, including many foreign embassies. More information can be found at his website, www.carlosriospaintings.com. A reception will be held Friday, Feb. 12, from 5 to 7 p.m. at Marshview Gallery. All are welcome to meet the artist. Refreshments will be provided. 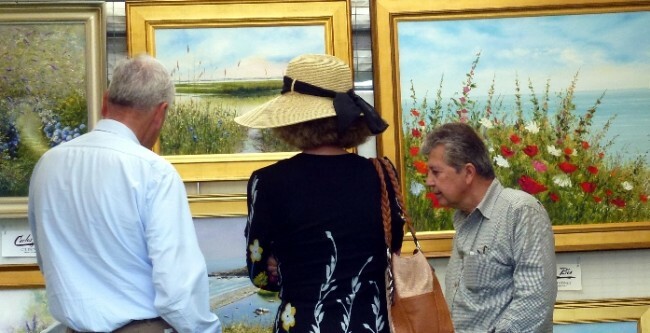 The Marshview Gallery at the Estuary Council of Seniors, Inc., 220 Main Street in Old Saybrook is open Monday through Friday from 8 a.m. to 4 p.m., and Saturdays from 8 a.m. to noon. All ages are welcome to view the gallery. AREAWIDE – Literacy Volunteers Valley Shore (LVVS) has announced that February’s monthly book promotion gives all aspiring cupids an opportunity to shine. Romance novels are the special feature of the month. Pay just $1 for five selected paperbacks or $1 for all hardcover romance novels. The book sale is located in the LVVS offices in the lower level of the Westbrook Public Library, 61 Goodspeed Drive. Hours are Monday through Thursday, 9 a.m. to 2 p.m., and Friday 9 a.m. to noon. All book sale proceeds benefit the LVVS tutoring programs. For more information, email info@vsliteracy.org or call 860-399-0280. In preparation for the holidays, the Essex Garden club members decorated merchant window boxes and tubs of the villages of Essex as well as the town park gazebo on Main Street. 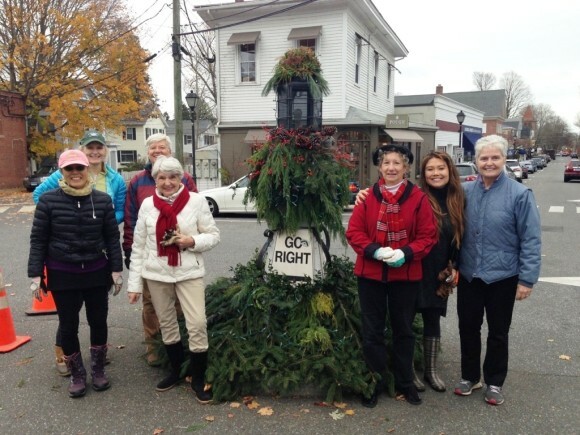 Using a variety of evergreen cuttings from members and other generous donors from the community, designers helped the town put on a festive face for the “Trees in the Rigging” held in November, and the Holiday stroll in December. The “Silent Policeman” was decorated this year (from left) by Lumie Han, Gay Thorn, Eve Potts, Kirsten Wendell, Sandy French, Mylan Sarner and Liz Fowler. Thanks to both Liz Fowler and Suzanne Tweed for their efforts in coordinating the day of decorating. Finally, The Essex Garden Club would like to thank the Essex community for its continued support, especially during their spring May Market and extends best wishes to all the resident of Essex, Centerbrook and Ivoryton for a Healthy and Happy New Year. Question: How does a hot band get recruited to play in a concert series? Answer: One way is when it sneaks up on and knocks out the series producer. This is how the booking for Caravan of Thieves, the musical ensemble that has dazzled audiences throughout North America with their creativity and showmanship, came to be. 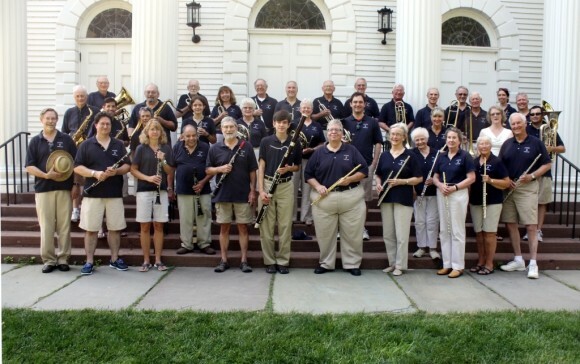 The band will perform at 5 p.m. Sunday, Feb. 28, at Congregation Beth Shalom Rodfe Zedek in Chester in a concert open to the public. David Zeleznik, the new director of the synagogue’s Music & More concert series, recalls that he had his first Caravan “experience” unexpectedly several years ago in Norwalk when it was the opening act for Hot Tuna. 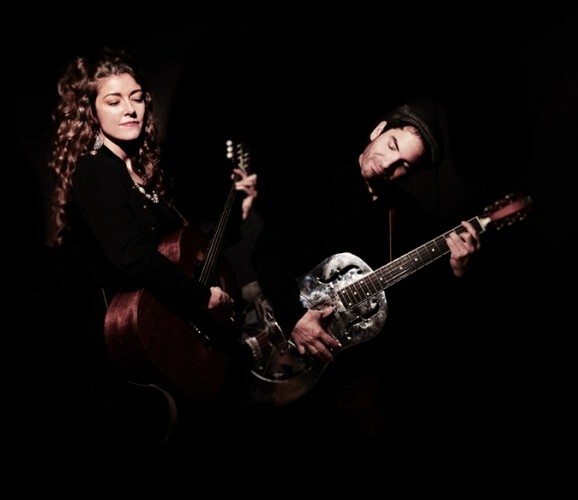 The couple added a violinist and an upright bass player in 2008 and the band released their debut album Bouquet in 2009. Their second album, Mischief Night, was recorded at a sold-out show in Fairfield. Caravan of Thieves released a third album in 2012, and a fourth last year. Samples of Caravan of Thieves music can be found on YouTube. Tickets ($25 general admission; no charge for children under 16) for this concert are on sale now and may be purchased online at cbsrz.org, or by calling the synagogue office at (860) 526-8920. Congregation Beth Shalom Rodfe Zedek is located at 55 East Kings Highway in Chester. 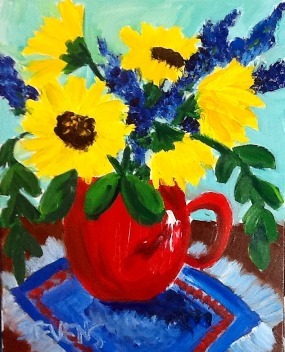 CHESTER – Come to Maple and Main Gallery on Sunday, Feb. 28 from 4 to 6 p.m. and create your own painting of a vase full of summery sunflowers. Gallery artist Cindy Stevens is hosting the Sunflower Painting Party and will bring all supplies as well as walk participants through the process step-by-step so they can go home with a painting. No prior art experience necessary. The cost is $40, and wine and light refreshments will be served. You can sign up and prepay by check or cash at Maple and Main; send a check to Cindy Stevens Fine Art, 30 East Main St, Clinton, CT 06413; or call Cindy at 860-304-1666 and pay with a credit card over the phone. Checks should be made payable to Cindy Stevens Fine Art. 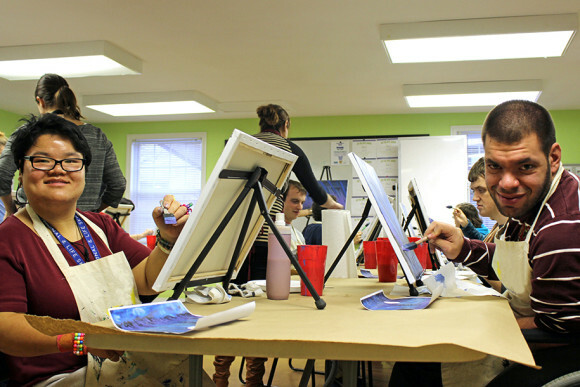 Space is limited and prepayment is necessary to reserve your seat, easel and canvas. Maple and Main Gallery is at One Maple Street in Chester. 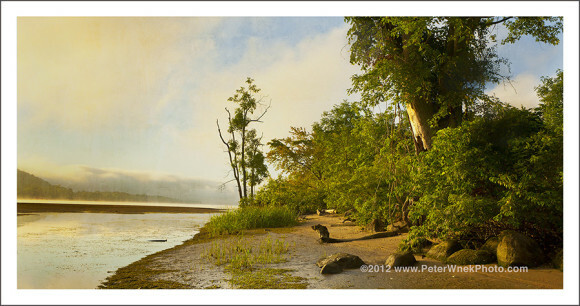 More information at mapleandmaingallery.com or by calling 860-526-6065. Anne Winslow, left, started the popular Kids Knit program at Chester Library. CHESTER – When Anne Winslow was age seven, her grandmother taught her how to knit. 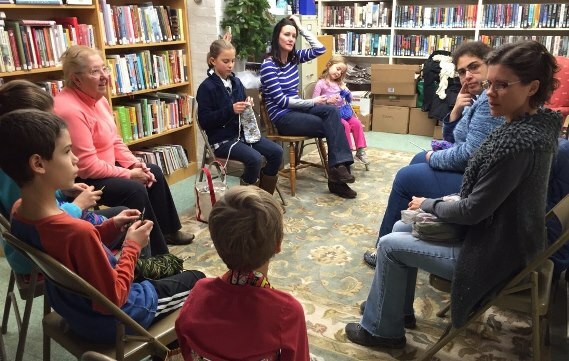 Now this Chester grandmother teaches children how to knit at the Chester Public Library on Saturday afternoons. The group has been growing and the 100-year-old library can get crowded. So the Kids Knitting group decided to share the art and fun of knitting with their friends. They will hold a knitting event on Sunday, Feb. 28, from 12 to 2 p.m. at the Chester Museum at The Mill, during Chester’s “Always on Sunday” happenings. The event is free and open to all. All children must have parental supervision. Assistance will be provided for new knitters. Beginner supplies will be available, or please bring your own. This event also gives the Kids Knitting group a chance to spread the word about their Knitted Squares Blanket project. They are collecting their knitted squares to be sewn into a blanket, which they will donate to a charity. For more information, call Chester Library at 860-526-0018 or visit Facebook.com/ChesterCTPublicLibrary. 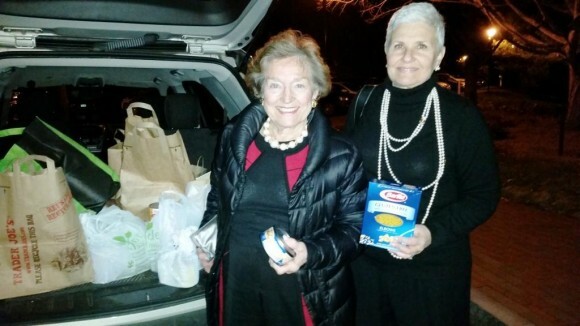 ESSEX — Essex Garden Club members collected nonperishable food items for the Shoreline soup Kitchens and Pantries (SSKP) at the club’s annual festivities at Essex Meadows. Individual members and the club donated $1,705 to the SSKP, which will be matched by the Gowrie Challenge. The total weight of the food donation was 376 lbs. Pictured packing the food for delivery are Barbara Campbell and Nina Thurston. AREAWIDE – Are there areas of your life that you would like to improve? Do you look at yourself in the mirror and say “if only I could be thinner, stronger, happier…” or “I wish I could worry less, have more energy,” etc.? Research shows us that even small changes in lifestyle can have a big impact on our improving our health. So why do we feel overwhelmed and powerless to change? This interactive workshop will help you explore what is important to YOU and get you started with an action plan for success. Strategies for making healthy lifestyle changes you can live with will be explored. This free event will be presented by Deborah Ringen, MSN, RN-BC Faith Community Nurse of the Visiting Nurses of the Lower Valley on Wednesday, Feb. 23, 12:30 to 2 p.m. at the Essex Library. Call the Library at (860) 767-1560 for more information or to register. The Essex Library is located at 33 West Avenue in Essex. Shoppers contributed more than $7,200 at Adams Hometown Markets during the past two months in support of The Great American Milk Drive. 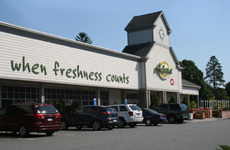 Customers at 12 Adams Hometown Market locations made $1, $3, or $5 donations, with the funds raised distributed in the form of over 1,400 milk vouchers to clients of the Connecticut Food Bank. A similar drive last year was very successful, says Tony Groszew, Adams Hometown Markets’ Director of Sales, who expressed appreciation to the hundreds of shoppers taking part in the campaign. The drive was part of a national effort aimed at providing highly desired and nutrient-rich gallons of milk to hungry families who need it most. The local effort also involved Guida’s Dairy, the New England Dairy Promotion Board’s Must Be the Milk program, and the dairy farm families of Connecticut. 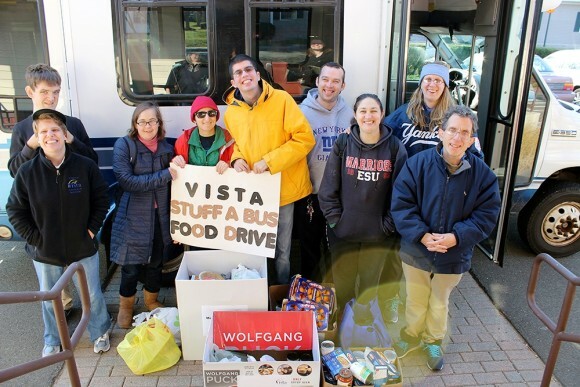 The donation drive included Adams Hometown Market locations in Deep River, Derby, Milford, Shelton, Terryville, Thomaston, Watertown, Canterbury, Lisbon, Plainfield, East Lyme, and Portland. ESSEX — The Friends of Essex Library are preparing for their Holiday Book Sale, featuring books in pristine condition suitable for gift giving, stocking stuffers, and hostess gifts—all with very attractive pricing. 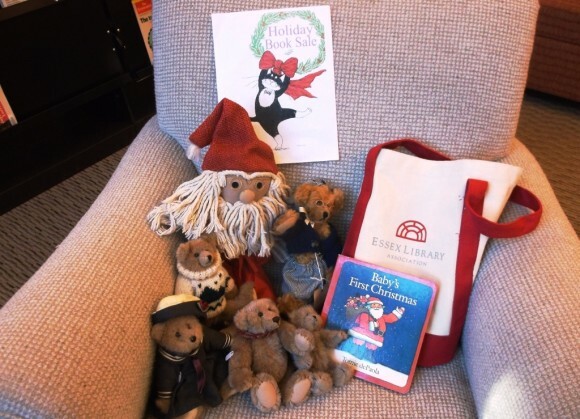 Also included in the sale will be adorable Teddy bears, Essex Library canvas tote bags, seasonal CD’s and DVD’s. The sale will run from Monday, Nov. 23, through Wednesday, Dec. 23, at the Essex Library, 33 West Ave., Essex. For more information, see the library’s website at www.youressexlibrary.org. The proceeds from this sale will support the Friends ongoing projects, special programs, and activities making the library a better experience for all who enter the newly installed doors, which were a gift from the Friends of Essex Library. Essex Wellness Center’s ‘Fitness on the Water’ facility. The River Valley Slim-Down Challenge, now in its fifth year, begins Jan. 9, 2016. It combines exercise and nutrition with a sense of competition and a chance to win some big bucks – all with the goal of losing a few pounds as we head into 2016. The River Valley Slim-down Challenge was created by Donna Scott, CPR, WLS, formerly of IFoundFitness in Deep River, who has recently been named as Manager of Essex Wellness Center’s Fitness on the Water facility on Novelty Lane in Essex Village. Scott is certified as a Personal Trainer and Weight Loss Specialist through the National Academy of Sports Medicine (NASM). She is also AFAA-Certified as a personal trainer, Zumba and Mad Dogg spin instructor. To join the challenge, participants pay an entry fee of $65 and then agree to take a minimum of two weekly Fitness on the Water group classes such as yoga, spin, barre, bootcamp workout, Zumba, or one weekly personal training session. The entry fee includes an initial wellness assessment and nutrition workshops throughout the 12-week period as well as fitness tips, advice and supervision from Donna Scott. The entry fee goes towards a jackpot, which also gets a boost from small “penalty fees” incurred when a participant misses a weigh-in or gains instead of loses weight in a particular week. The prize jackpot will be divided by the three top “losers” in terms of body weight percentage. In addition to the jackpot, top ranking winners receive prizes from local businesses including Essex Wellness Center massages, and more. “Everyone who has entered in the past has lost weight and feels better about themselves, which is the greatest reward of all,” says Scott. To join the 2016 River Valley Slim-Down Challenge, call 860-581-8225 or email donna@essexwellnessctr.com The Challenge runs Jan. 9 through April 2, 2016. Participants may enter individually or as a group with friends or colleagues. Sign-up before Jan. 9 and receive a three-class pass to Essex Wellness Center’s Fitness on the Water. To learn more about Essex Wellness center, visit www.essexwellnessctr.com or facebook.com/essexwellnesscenter. At 7.26 p.m. precisely on Saturday, Dec. 12, Laurent Fabius, president of the United Nations Framework Convention on Climate Change (UNFCCC) COP 21 , choking with emotion, announced that an universal accord had been reached. The several thousand people in the audience rose in a standing ovation and started congratulating each other. After two sleepless nights, the “facilitators” wrenched out an agreement by consensus from the 195 Convention’s members. The suspense lasted until the absolute final minute when Nicaragua tried to interrupt. It was too late — the president had already snapped down his gavel. The conference could very well have been a failure – it had to overcome a block from the oil-producing countries such as Saudi Arabia – but on that last day, there were no grim faces, as had been seen in Copenhagen, only a general enthusiasm. President Barrack Obama is expected to use an Executive Order to avoid the likely opposition of the Republican majority in the Congress; in the absence of coercion and sanctions — a mechanism of control by satellite (France is financing the “MicroCarb” satellite) — provides an attempt at transparency and ongoing verification by a committee of experts thus making the agreement de facto binding. Never before has there been such an awareness of the threat caused by global warming. The vagaries of the climate and the fact that 2015 is the warmest year in recorded history contributed to this sense of urgency. Today any debate about climate skepticism has become obsolete. What makes the Paris conference different from all the ones before is a groundswell of positive intentions. For the first time the main polluters of the planet – China, the US and India – are on board and are determined to make the agreement work. Already 187 out of the 195 countries have announced their voluntary contributions. Today the action of society as a whole is crucial. It is important to note that, at the Bourget, the Non-Governmental Organizations (NGOs), private associations and a number of organizations were working just a few steps from the UN “Blue Zone” for government officials (at the Lima, Peru, COP, they had been “exiled” 15 kilometers away). Giant screens in the hallways made it possible for the general public to follow the proceedings, breaking away from the closed door policy of the past. After the initial euphoria felt on Dec. 12, a number of questions remains unanswered, some of the objectives are unclear – no date was set as to when to reach the greenhouse gas neutrality nor when to end the use of fossil energy, no price was put on carbon – and the unfairness of many decisions has become apparent – such as the financing and the sharing of responsibilities between the “North” or rich countries and the developing countries — or to put it another way, who pays whom and for what? Until now Europe, and France in particular, have been paying a great deal. A country such as Russia has not paid one cent so far. Are China and India – the big polluters of the planet – still considered as part of the developing world and expected to be on the receiving end of hundreds of billions of Euros? 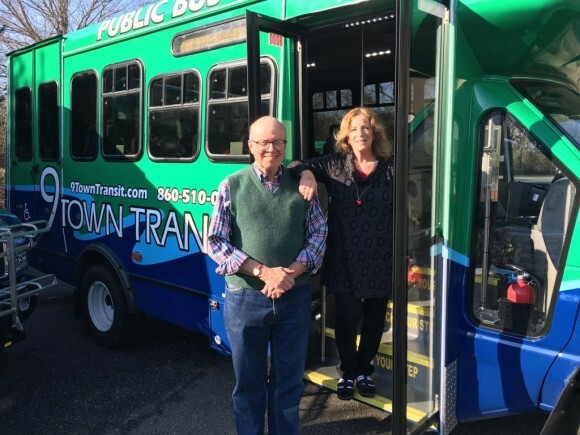 9 Town Transit board members Leslie Strauss and John Forbis show off the agencies newest buses. Photo by Estuary Transit District. AREAWIDE — 9 Town Transit welcomed four new buses into its fleet this December. The new buses feature the bright blue and green design and offer the latest in passenger comforts. These buses will expand the district’s fleet to accommodate its tremendous growth in ridership over the past several years. The total cost of $337,708 was paid for with Federal Transit Administration and Connecticut Department of Transportation. LVVS’s 2015 ‘Unsung Hero’ Lorraine Lieberman. Photo courtesy of Joanne Argersinger. WESTBROOK — Lorraine Lieberman of Killingworth was awarded this year’s Literacy Volunteers Valley Shore (LVVS) “Unsung Hero” award at the annual LVVS Holiday Social on Dec. 8. 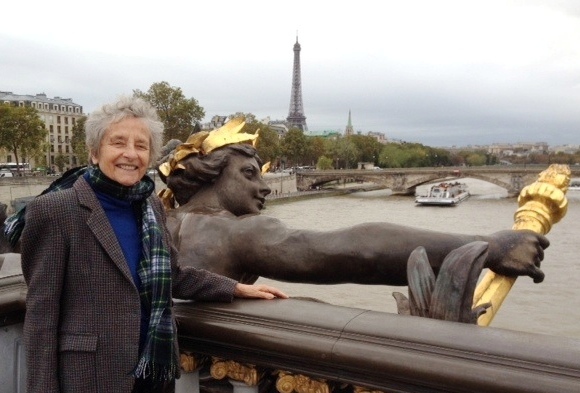 Her many contributions throughout the years have helped both tutors and students to improving English language skills and the quality of life in our shoreline communities. Lieberman is an active tutor, tutor interviewer and tutor contact person for the organization. Literacy Volunteers Valley Shore is most grateful for her dedication, service and ‘always going the extra mile’ in the cause of literacy. Acton Public Library is now taking applications for the honorary position of Old Saybrook Poet Laureate. Applications can be requested from the library or downloaded from the library’s webpage. The deadline for application submissions is January 31, 2016. All applications received will be reviewed by a selection committee, appointed by the library board. The Old Saybrook Poet Laureate will be announced on March 18, 2016. A formal recognition will take place in April, at the library’s annual poetry night celebration. At their October meeting, the Acton Public Library voted to begin the search process for the first poet laureate for the Town of Old Saybrook, joining other communities throughout the state who have appointed residents to this position. The mission of Old Saybrook’s Poet Laureate Program is to communicate the value of poetry and use poetry as a means to inspire, inform, and entertain the community at large. The Poet Laureate of the Town of Old Saybrook will serve as the ambassador of the community’s vibrant literary life, promoting its literary community and celebrating the written word. To be considered for the position, a nominee must be a poet and resident of Old Saybrook, over 21 years old, and available and willing to collaborate with other Connecticut town poets to develop and present poetry-related activities that address the objectives of the laureate program. Interested poets can self-nominate or be nominated by others. Applications are available at the library, or may be downloaded from the library’s website. For more information, please contact the library at 860-395-3184, or our website: www.actonlibrary.org. Three Old Saybrook-Westbrook (OSW) Youth Football players have been named to the Connecticut 8th Grade team for the Football University National Championship. Defensive lineman Justin Badolato from John Winthrop Middle School, linebacker Jeffery Miller from Westbrook, and center Dominic Santullo of Old Saybrook were chosen after a series of tryouts and will compete in the second round of tournament games this Saturday against Southern Jersey in Lewisburg, West Virginia. Round one was played in Rhode Island and New Hampshire. Victory this coming weekend will mean they move on to compete against Indiana. The FBU National Championship is described by the organization as the single biggest event in youth football. Sixty-four teams from all over the United States and Canada representing their state or province battle in a single-elimination tournament to determine the national champion. 6th, 7th and 8th grade divisions compete throughout the month of December to be crowned national champion. Participants include 6,000 athletes representing thousands of youth leagues. This year the FBU “Championship Weekend” is in Naples, Florida to showcase the best teams in the nation. All American Games, parent company of FBU, is a sports management and marketing company based in Rockaway, N.J., that produces and manages many of the nation’s premiere high school and youth sporting events, including the U.S. Army All-American Bowl for the country’s best high school players. 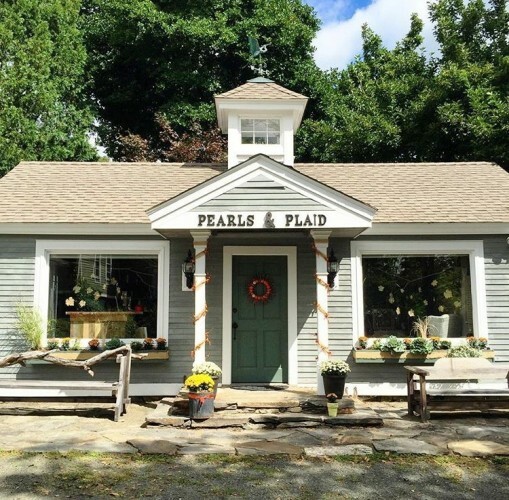 The charming exterior of ‘Pearls and Plaid’ in Haddam, Conn.
A peek inside the store..
WESTBROOK — Literacy Volunteers Valley Shore (LVVS) is pleased to congratulate the 2015 Fall class of tutors. Tutors are trained through comprehensive nationally accredited workshop sessions held by Literacy Volunteers. On completion of workshop sessions, trainees receive certification as a tutor and are assigned a mentor for support and guidance. Trained volunteer tutors are matched with students in English as a Second Language or Basic Reading. Tutors carry out our mission of providing one-on-one tutoring to anyone seeking to improve their English skills. Through the LVVS services, students become acclimated to American culture and the English language resulting in them becoming productive, happy members of the community. There is no cost to the student. Congratulations to the 2015 Fall class of tutors: Deborah Huddy of Clinton, Susan Taylor of Clinton, Rosanne Vinci of Clinton, Paul Aresta of Deep River, Karol Gardner of Deep River, Joseph Katan of East Haddam, Tricia Carey of East Lyme, Margaret Azarian of Guilford, Sandra Maccarone of Madison, Anne Maxwell of Niantic and Jane Gonzalez of Old Saybrook. Learning through STEAM (Science, Technology, Engineering, Arts and Math). The Country School is one of three finalists selected to advise the United Arab Emirates (UAE) Ministry of Education as it seeks to implement a STEAM (Science, Technology, Engineering, Arts and Math) curriculum for all Kindergarten-3rd Grade students. Following a global search, the UAE identified the independent Pre-School through 8th Grade school as one of its top three choices to assist with the planning and implementation of the nationwide STEAM initiative. If selected, The Country School will partner with SmartStart Education, an academic solutions company based in New Haven, to plan and oversee implementation. Founded in 1955, The Country School serves 200 students, ages 3-14, on its 23-acre campus in Madison. 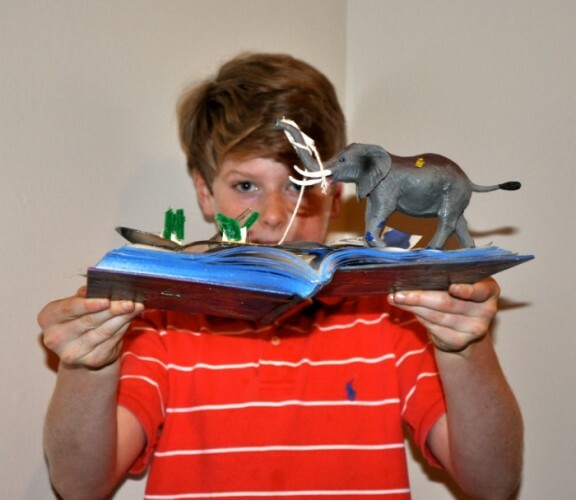 STEAM is one of several signature programs at The Country School; others include Elmore Leadership, Outdoor Education, and Public Speaking. Through STEAM, students are invited to tackle real-world problems that require them to ask challenging questions and work together to come to a solution. By integrating all elements of the curriculum, STEAM engages all learners, and the hands-on, creative nature of a STEAM exploration means the learning will last. Perhaps most importantly, STEAM gives students the skills they need for success in the future—communication, collaboration, critical thinking, and creativity—and the inspiration to be tomorrow’s innovators. Since adopting the STEAM model five years ago, The Country School has shared its learning in a variety of ways: during a summer teacher institute, through periodic teacher workshops, and through a series of STEAM events for area students and families. In addition, Country School teachers have been invited to facilitate STEAM workshops at outside conferences. The Country School also hosts regular forums on the topics of parenting and education through its Teacher Institute-Partnering with Parents program. The next Teacher Institute-Partnering with Parents event will have a STEAM focus when, at 6.15 p.m. on Feb. 4, 2016, The Country School hosts a screening of Most Likely to Succeed, the acclaimed new film that invites us to reimagine education. This has been brought forward from the previously announced 7 p.m. time to allow for a panel discussion and Q & A after the film. Visit www.thecountryschool.org or contact communications@thecountryschool.org for more information. For more about SmartStart Education, visit www.smartstarteducation.com. 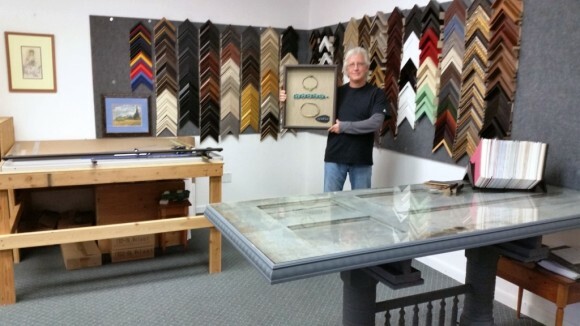 Artisans Harbor is very pleased to announce the addition of -Ron’s Custom Framing Ron Staskelunas brings with him 10 years of custom framing experience. He apprenticed with the best in the business and honed his technique prior to launching his own framing business located at Artisans Harbor 188 Main Street Old Saybrook. 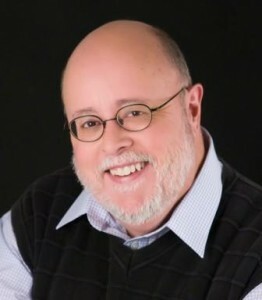 Ron’s expertise and creative eye will ensure each customer is more than pleased with a collaboratively selected frame, matting or shadow box for fine art paintings, photography, prints, mirrors, needlepoint, collages, posters, keepsakes, heirlooms, jerseys and pretty much any memorabilia. Artisans Harbor is also announcing three new artists showing now through Jan. 15th. 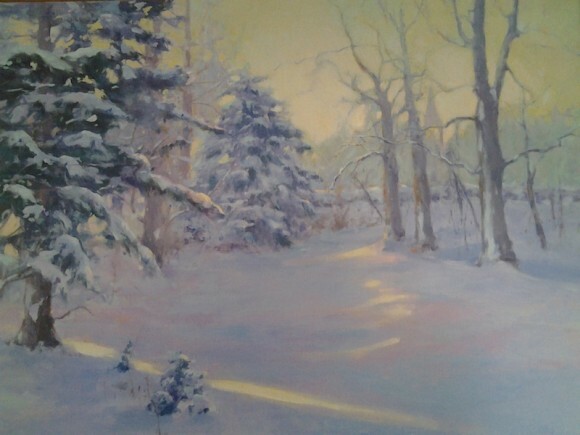 Pastel painter Steve Linde is a signature member of the Connecticut Pastel Society and also serves as its Vice President. He has won awards at the CPS Renaissance Shows. Mary Mellot has been painting in landscapes, still life, and portraits in oils for over 40 years and her paintings are in collections throughout the U.S. She is the recipient of numerous awards for her portraiture paintings. Old Lyme artist Randie Kahrl’s painting style is varied and often unexpected. An artist who is still evolving, she has certainly mastered different aspects of art, and yet is anxious to always explore new areas and ideas, whether it is color, edges, impasto and texture or simply the tension created by dramatic lighting. Visit Artisans Harbor Wed.-Sat. 12-5pm. Left to right: Connecticut Department of Veterans Affairs Commissioner Sean Connolly, Lt. Gov. Nancy Wyman, Connecticut Veterans Hall of Fame Class of 2015 Member PW Louthain, and Sen. Art Linares. 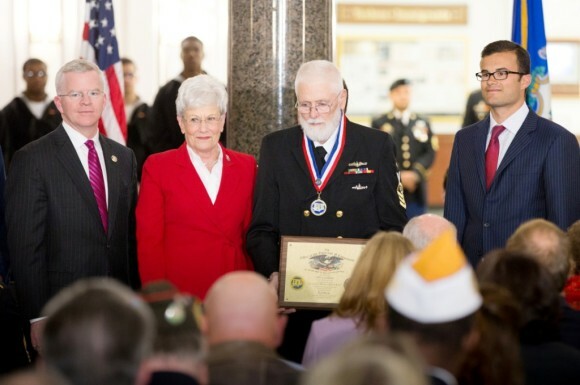 U.S. Navy veteran PW Louthain of Deep River was inducted into the Connecticut Veterans Hall of Fame’s Class of 2015 during a Nov. 30 ceremony at the Legislative Office Building in Hartford. The Hall of Fame was established in 2005 to recognize the continued contributions of Connecticut veterans to their cities and towns. This year, 11 veterans joined the 104 veterans who are currently in the Hall of Fame. State officials, including State Sen. Art Linares, were on hand to congratulate Louthain and thank him for his service to his country and to his community. Louthain served in the Navy for 20 years as a Senior Chief Machinist Mate and then worked for Electric Boat in Groton. While at EB, Louthain and a group of other U.S. submarine service veterans decided to sponsor and organize a Groton Sea Scout ship. A Sea Scout “ship” is the functional equivalent of a boy or girl scout troop. As a member of the Westbrook Elks Lodge 1784, Louthain has served as liaison to the Westbrook-based Sea Scout Ship Stars and Stripes 1784. The co-educational youth organization helps youth in the region to gain confidence and become good citizens. ‘Village Morning’ by Barbara Lussier is one of the signature paintings of the exhibition. 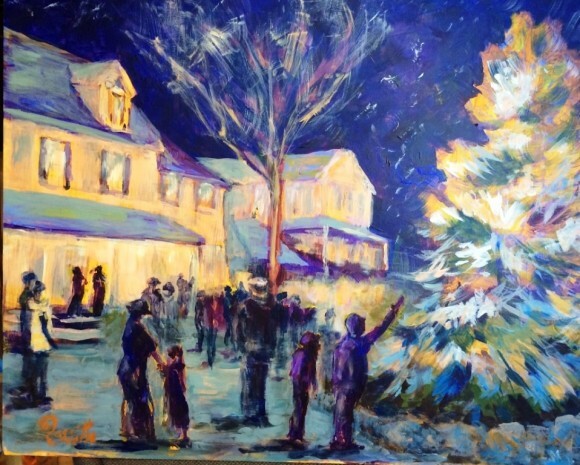 The Lyme Art Association’s (LAA) festive art exhibition and sale, Deck the Walls, opened Nov. 27 and is on show through Jan. 8, 2016. An opening reception featuring live music will be held next Friday, Dec. 4, from 5 to 7 p.m. Admission is free and all painting purchases from 5 p.m. on Dec. 4 through 5 p.m. Dec. 5 will be tax-free. More than 200 original works of art by member artists will be on display and priced to sell as holiday gifts. Artwork by newly inducted LAA Elected Artists will be featured in their own exhibition in the Goodman Gallery. The LAA is open Wednesday through Sunday, from 12 to 5 p.m., and by appointment. 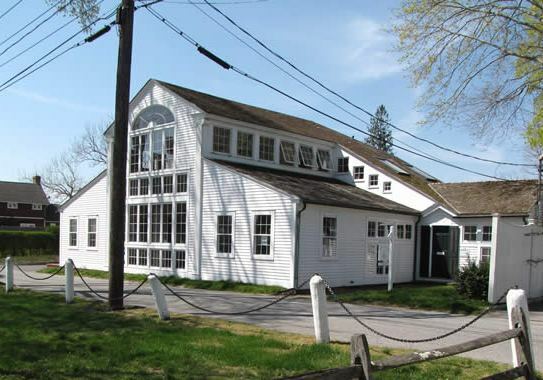 The building is located at 90 Lyme Street in Old Lyme, at the corner of Halls Road. 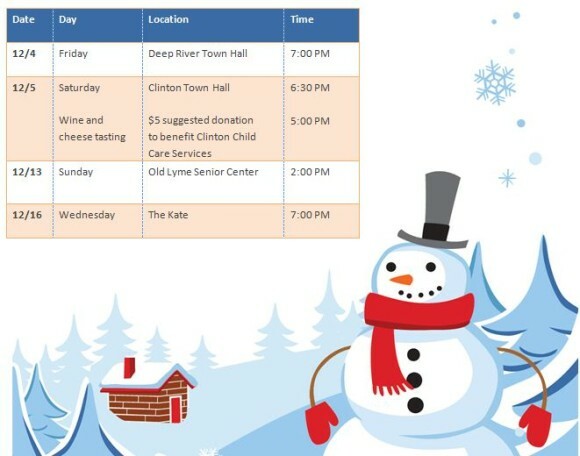 The Old Lyme Town Band will be performing a holiday concert in the Deep River Town Hall this evening at 7 p.m. All are welcome and admission is free. Visit OldLymeTownBand.org for more details. Like irritating mosquitoes on a hot summer afternoon, three fighter planes of the German Luftwaffe fly over a majestic and impregnable Louvre museum. This is the opening image of Francofonia, a documentary reflecting on art and the courage of men fighting to protect it against forces of destruction. A most appropriate and needed interlude at this particularly tense time for the humanity. Although labeled a documentary, Francofonia – a Russian-German-French production – is part newsreels, part fiction, part poetic images. The film, directed by the well-known Alexander Sokurov, won an award at the September 2015 Venice Film Festival. A scene from ‘Francophonia.’ Image courtesy of Films Boutique. Ironically both men are on an identical mission. In 1939, most of the Louvre’s art work, including the “Victory of Samothrace” – the museum’s most illustrious treasure – was removed by the staff and hidden in the cellars of French castles. Metternich had done precisely the same thing with the collections of the Cologne cathedral before the start of the war. With an element of pathos, Sokurov imagines the visit of German military to the Louvre. Did they realize it was an empty place except for Assyrian winged bulls and other monumental sculptures, which might have been left on purpose to act as the watchdogs of an idea? Sukorov accompanies us through an empty museum filled with the memory of treasures now gone. A hand touches the diaphanous finger tips of a statue; Clouet’s delicate portraits come alive; and so do Millet’s peasants, sitting by the fire, their deeply-lined faces showing their exhaustion. The greyish, almost sepia, quality of the photographs adds to the eerie feeling. The camera moves in and out of the Louvre and depicts difficult scenes, which demand pause for thought. A tanker is struggling in the fury of the Baltic. Will the works of art it carries in its containers survive or be crushed by the waves? The frozen body of a well-dressed little girl lying on a street during the siege of Leningrad evokes the human suffering caused by war. Francofonia is a complex film, which can be read on several levels. It came on the Paris screens not long after the blasting of Palmyra and other archaeological sites by Daesh (ISIS). The message is crystal clear — art, which is the legacy of our civilization, is too precious to die. In 2015 the Essex Tree Committee received donations of 40 trees from both individuals and community organizations. 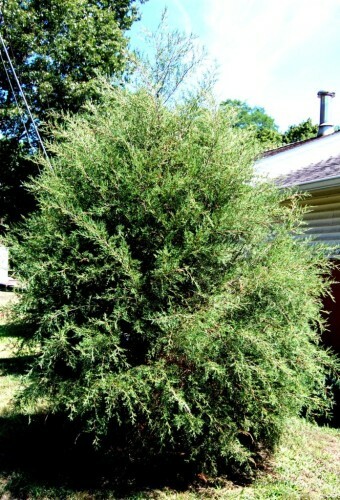 Thirty three of these trees were Eastern Red Cedars planted at the West Avenue gateway (see photo). These were donated by the Essex Foundation and the Essex Fire Department. Other trees included a Swamp White Oak tree located at the Methodist Hill donated by the Essex Police Union. Two Princeton Elm trees, donated privately were planted at West Avenue and South Main Street. A Sunset Red Maple donated by the Essex Rotary Club was planted also at South Main Street. The Essex Garden Club donated a London Plane, planted at 15 Dennison Road. The Essex Tree Committee donated a Saucer Magnolia to the Essex Elementary School. And Bartlett Tree Experts planted a Red Sunset Maple at 147 Dennison Road. Augie Pampel, Essex Tree Warden, thanks all who donated trees to the town of Essex in 2015. These trees will enhance the beauty of the streets of Essex for many years to come. To make a donation to the Essex Tree Committee, please contact Augie Pampel at augiepampel@att.net.